We’re still in the midst of the hot, humid Nashville summertime, and there are few things that are quite as refreshing in hot weather as a frozen treat. Ice cream, frozen yogurt, popsicles and slushies – I love ’em all this time of year. So, I thought recently, what a perfect time to finally give my new(ish) ice cream maker a try! 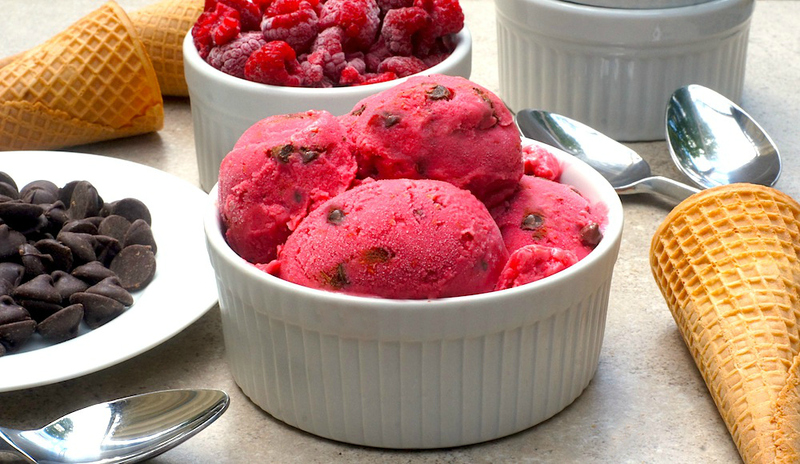 I looked up a ton of possible ice cream and fro yo recipes, and settled on this Raspberry-Chocolate Chip Frozen Yogurt. Berries and chocolate are one of my all-time favorite combinations, so I had a good feeling that this would be a success. And y’all, this frozen yogurt turned out SO deliciously. Such a fabulous recipe to break in my new ice cream maker! 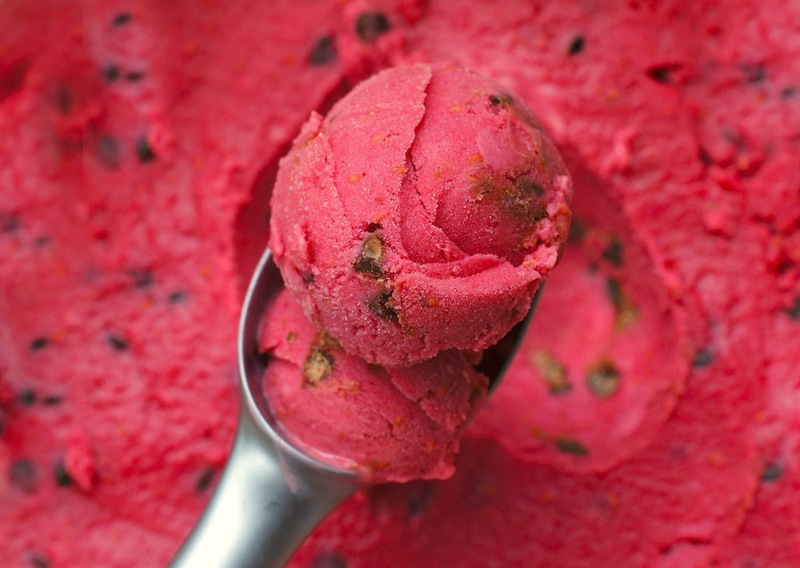 The naturally-tart raspberries mean that this frozen yogurt isn’t overwhelmingly sweet. The tart berries balance wonderfully with the sweet, rich chocolate chips and the slight tang of the yogurt. The texture is also perfect – not quite as icy as sorbet, but not quite as creamy as straight-up ice cream — it’s about halfway in between, which I love. And did I mention that it’s pretty darn healthy? With less than 150 calories per serving, but 4 good grams of protein, you can enjoy this scrumptious frozen treat without having to feel guilty about it. You can’t beat that! Place raspberries, yogurt, sugar and vanilla in a food processor and process until smooth. Transfer the mixture to an ice cream maker (or see “No Ice Cream Maker?” note below). Freeze according to manufacturer’s directions, or until desired consistency. Add chocolate chips during the last 5 minutes of freezing. Transfer to an airtight container and freeze until ready to serve. No Ice Cream Maker? Pour the mixture into a 9-by-13-inch pan and place in the freezer. Stir every few hours, until the mixture is firm along the edges and semi-firm in the center, 2 to 6 hours. Transfer to a food processor and process until smooth. Transfer to an airtight container, stir in chocolate chips, cover and freeze until ready to serve. Store in an airtight container in the freezer for up to 1 week. Let stand at room temperature for about 30 minutes before serving. This sounds like I would LOVE it! Beautiful color, too! Perfect way to break in your ice cream maker and that color!! Love the berry chocolate combo! Our ice cream maker broke and I need to find a new one. This is the one I have and I love it! http://www.williams-sonoma.com/products/cuisinart-ice-cream-maker-extra-freezer-bowl/ Admittedly, it’s the only ice cream maker I’ve owned, so I have nothing else to compare it to, but it’s been fantastic so far! My boys would flip out over this, amazing!! this is gorgeous and I love the combination of raspberries and chocolate together! What a delicious treat! Wow that does look good. Normally I pair raspberries with white chocolate but I love how those little chips look in this. Almost like watermelon haha. Yummy! I’ve always wanted to make my own ice cream… homemade is always the best! This sounds perfect for a hot afternoon! Thanks, and enjoy your ice cream maker. mmm, i’d love a bowl right now! it’s so hot this week. i got an ice cream maker last year and haven’t made frozen yogurt yet. need to change that! Yum-O, Amy!! This sounds like a perfect excuse for me to snag my parents’ ice cream maker. We haven’t felt the need to invest in one yet…but this recipe looks and sounds SO amazing. I love ANYTHING involving fruit and chocolate. Mmmm! 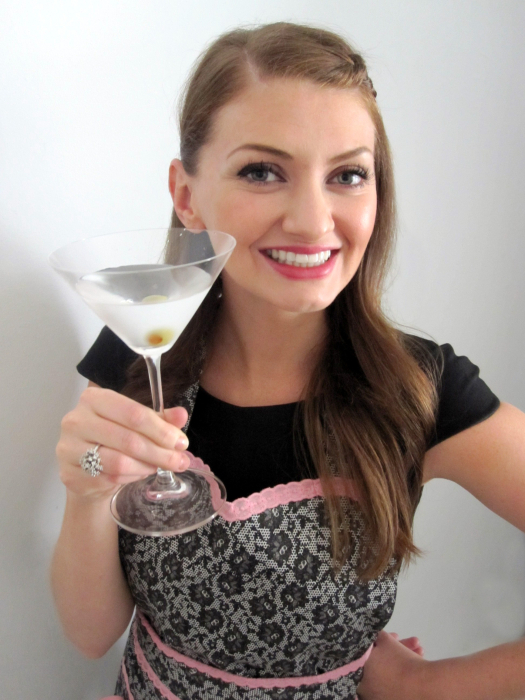 Thanks for the scrumptious recipe, Amy!! This looks gorgeous Amy! Yay for a new ice cream maker and love the raspberry and chocolate chip combo The color is so so pretty too! this looks so delicious!! too bad it’s so cold and rainy here in the UK (i shouldn’t complain as it was glorious the week before) but I would love a cup of that! Chocolate and raspberries are a terrific combination. What a great summer treat! Congrats on the new ice cream maker – they are so fun! This looks delicious and the color is pretty spectacular! This looks so mouthwatering! I am a sucker for frozen treats, especially in summer of course. Thank you for the no ice cream maker option. This will come so handy. Still hot as Hades here in S FL. I am absolutely making this! When I saw this on your IG page, I hightailed it over here to drool and pin. I’m definitely a berries and chocolate fan too.